We are a family run business and believe this makes our service and personal relationships with our clients second to none. We pride ourselves on the excellent, professional and efficient service we provide when dealing with property lettings whether they are long term or short term. We purchased our apartment in Palomares as we had visited and fallen in love with the beautiful Spanish coast line and constant sunshine. The complex is friendly and filled with English, Spanish and European residents some who are lucky enough to live there all year round. It is in a quiet Spanish village but only a ten minute drive away from the busier harbour villages if we don't feel like cooking! Due to it's location we often use it as a base to tour the local area often taking picnics and beach towels. I just wish we had more time to visit. We always hire a car from the airports, as the highway is so easy to navigate and all the villages are connected by quiet roads so driving on the wrong side isn't an issue. Bath with shower, sink, WC and bidet. Complete with a large sofabed, dining table and chairs for 4. TV. Coffee table. Large patio doors leading onto front private terrace and garden. A well equipped kitchen with cooker, hob, fridge/freezer, washing machine, kettle, toaster, microwave, iron, grill and breakfast bar joining dining/living room. 10 mins from the Desert Springs Golf club the first and only desert golf course in Europe and has been built to the full USGA specifications and quality standards of the now famous desert courses of Arizona and California. The fairways have been kept generous to ensure that the less expert player can enjoy and improve his game whilst absorbing the awesome landscape and views that encompass The Indiana. On the other hand, every hole has features which can be brought into play; the springs, watercourses, dry river beds, rock and cactus areas and bunkers are strategically located to examine the skills of golf's leading players when playing off the championship tees. Also 15 mins from Valle Del Este Golf Club. The Valle del Este 18-hole golf course has been carefully designed to combine holes that represent a real challenge to the player. The golf course has been designed by José Canales, with attention to detail integrating the course into the surrounding landscape. Outside: The complex is situated close to the beaches of Vera Playa, Puerto Rey and Palomares as well as the village and larger towns. There is a private pool for use of guests and a separate children's pool. The complex is secure and gated with attractive well kept gardens. It is possible to use the pool all year but better in April to November. There are 2 private patios, with gardens and patio furniture. Cleaning / Towels / Linen / Maid service: Apartment supplies towels and linen which is laundered before and after your stay. Cleaning and fresh linen is available during your stay for breaks over 7 days. Other: There are 2 folding beds suitable for a child or small adult or for around the pool. The complex is suitable for children, with fenced secure areas around pools and a small children's pool. There are sun loungers for your use as well as pool toys. All you need for a seaside break! From booking to arrival, everyone was more than helpful. The apartment was compact but more than adequately equipped for every eventuality. A small kitchen which provided all amenities needed - fridge/freezer, washing machine, cooker and small appliances. Two terraces, front and back. A spacious sitting area/diner and bedroom with twin beds, air conditioning, fans etc. There's various beach and picnic equipment so all you need really. Only a 2 min. drive or 10 min walk from the beach with a couple of bars/restaurants. No wi-fi but we managed without it. Overall we had a really enjoyable holiday and would recommend it immensely. The apartment was lovely with everything we needed and thankfully had airconditioning that we used every night after finding the instructions in the room file. The complex its self was very clean and tidy with a great size pool. The village of Palomares is very Spanish but has a couple of good English Restaurants as well a Spanish. A car is definately needed as there is so much to see with lovely beaches and pretty villages especially Mojacor in the mountains. We will definately be back!! The gardens had not been tended and the apartment was really dirty which had to be cleaned again by ourselves, not something you'd expect to be doing the 1st day of our holiday. The cleaner showed us round but said she didn't have time to do the gardens as she had not been well and didn't know how to use the aircon either. So sorry to hear you felt this way we pride ourselves on providing a lovely and clean apartment for people's holidays. The gardener tends the garden on a regular basis and has been again this week. Sorry to hear you feel it was not upto standard we pride ourselves on our repeat business and have never received a negative comment regarding the people who look after it for us, and will look in to your comments. Muy buen sitio. Llevamos ya dos años pasando las vacaciones aqui, lo unico que estaria bien que la calidad de los colchones se mejorara ya que una semana durmiendo hay se hace un poco complicado. No esta cerca de la playa si buscas ir andando. There are local markets in the area every day within 15km and other traditional villages for crafts and pottery. There are many sports nearby, including scuba diving (you can learn to Padi dive, details given), also hire bikes. There is a waterpark open during the summer months and large supermarkets within 2km. there is tennis, paddle tennis, sea fishing walking and plenty of beaches/bars and restaurants. The beach is a 10 minute walk or about 800m. There is the lovely sandy beach of Vera Playa and Palomares with its beach bars and restaurants. Also a short 10 mins drive to Garrucha harbour with fantastic beaches, bars and restaurants also between the villages the golden sands of Purto Rey. Located on the southern coast of Spain. The nearest airport is Almeria (50km) then Murcia (70km) and Alicante (90km) approx. Car hire is recommended to make the most of the area. The apartment is in the village which has shops and bars, including a pizza bar and English sports bar. 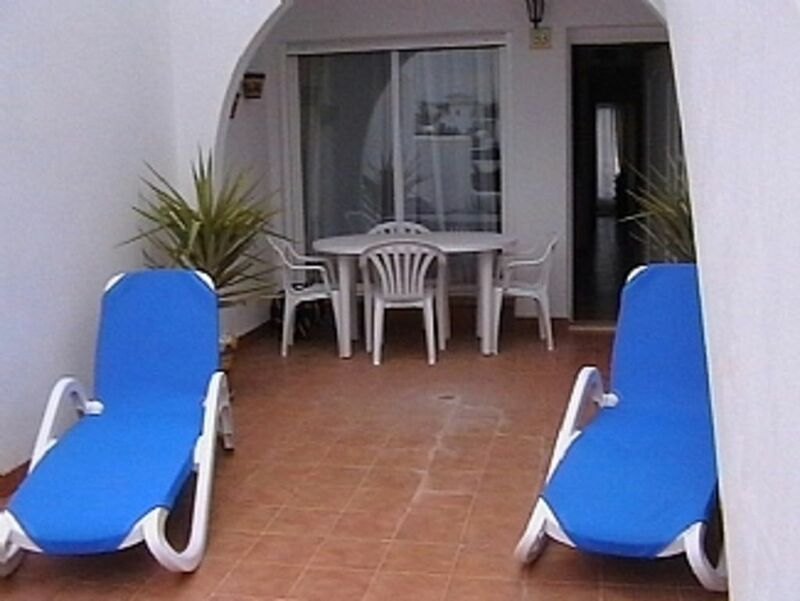 Villaricos and Vera Playa are 2km away, Garrucha and Vera approx 4km distant and Mojacar playa and pueblo 7km away. Beautiful beaches at Puerto Rey, Vera Playa, Mojacar & Garrucha. Water Park. Go-karting. Horse riding. Water sports Centre. Leisure centre. Mini hollywood. Cabo De Gata National Park. Desert Springs Golf Club. Diving Centre. Leisure Centre. Campo De Golf. Water Sports Centre. (Windsurfing, Catamaran, Canoes & Kite Surfing). Cabo De Gata National Park. Traditional Bull Ring ( Vera). 16th Century Churches.